VMware developed VMmark as a standard methodology for comparing virtualized systems. According to VMware’s VMmark website, the benchmark system in VMmark is comprised of a series of “sub-tests” that are derived from commonly used load-generation tools, as well as from benchmarks developed by the Standard Performance Evaluation Corporation (SPEC®). In parallel to VMmark, VMware is a member of the SPEC Virtualization subcommittee and is working with other SPEC members to create the next generation virtualization benchmark. In testing the terms, a “tile” is simply a collection of virtual machines (VM’s) that are executing a set of diverse workloads designed to represent a natural work environment. The total number of tiles that a server can handle provides a detailed measurement of that server’s consolidation capacity. The more tiles, the better. The faster the performance, the better. comes 4 Ethernet ports via two embedded Broadcom NetExtreme II Dual Port 5709S Gigabit Ethernet NICs with failover and load balancing. One important note is that Dell has 4 I/O mezzanine cards. 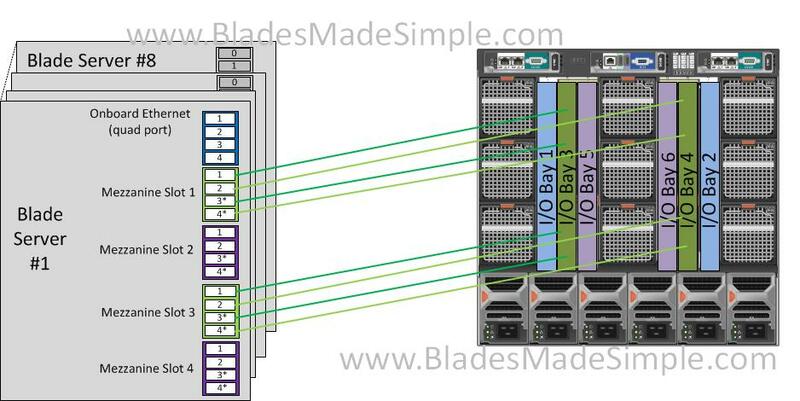 This is very important to understand, so let’s take a look at the Dell M1000e Chassis’ I/O Mapping. YES – this looks complex, but it’s not. Here’s the breakdown by I/O Bay Module. 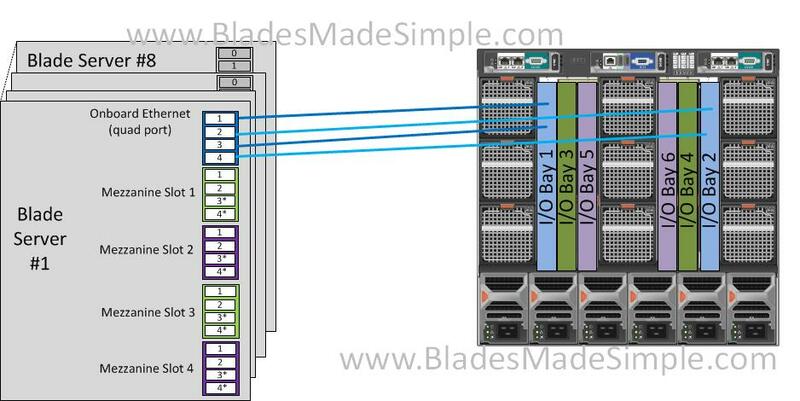 For the record, I have them labeled as “I/O Bay 1 – 6” however Dell uses “A1, A2, B1, B2 and C1, C2”. They are the same – I just listed them numerically to make it easier to follow. These I/O Bays are connected to the on-board Ethernet. In the case of the M910, there are 4 Ethernet ports. These I/O Bays are connected to Mezzanine Card Slots 1 and 3. These can provide 4 ports per card if a QUAD port card is used – otherwise, only two ports would be used. These I/O Bays are connected to Mezzanine Card Slots 2 and 4. These can provide 4 ports per card if a QUAD port card is used – otherwise, only two ports would be used. 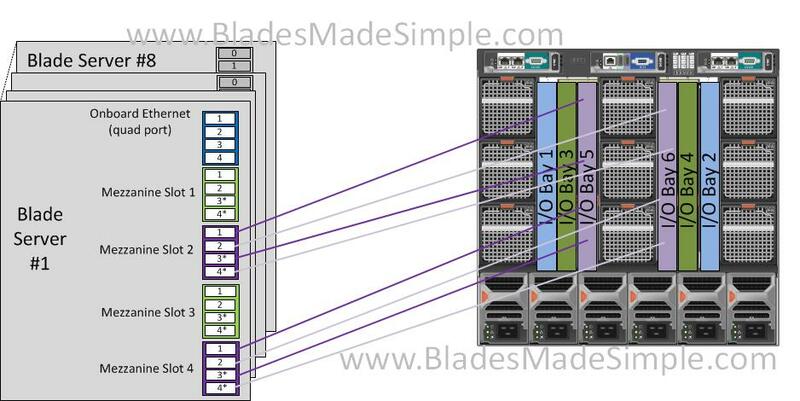 In fact – if you didn’t need the Fibre HBAs, you could put in 2 x Quad port Ethernet cards and have ANOTHER 8 Ethernet ports (total of 20)! This is remarkable! No more physical I/O port limitations, you can achieve the quantity of I/O ports you need without moving to 10Gb. It extends the Scalable Memory Interconnects (SMI) from CPU 1 and CPU 2 to the memory subsystem of CPU 3 and CPU 4. 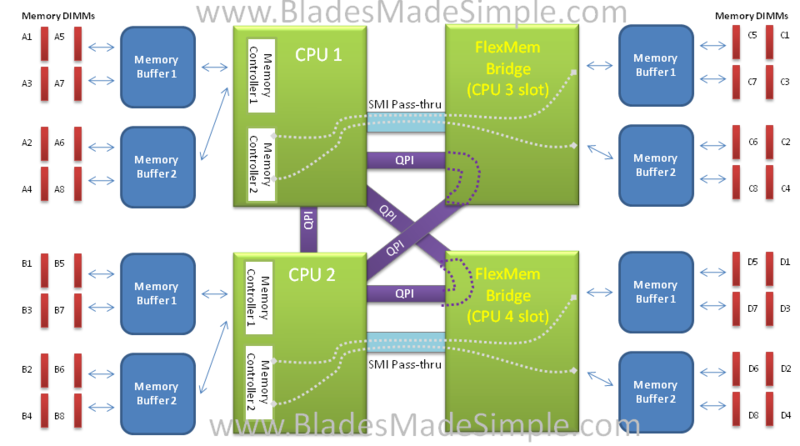 It reroutes and terminates the 2nd Quick Path Interconnect (QPI) inter-processor communications links to provide optimal performance which would otherwise be disconnected in a 2 CPU configuration. Sometimes it’s easier to view pictures than read descriptions, so take a look at the picture below for a diagram on how this works. So – that about covers it.